The FT2232H is available in Pb-free (RoHS compliant) 64-pin LQFP/QFN and 56-pin QVFN packages. Single chip USB to dual serial / parallel ports with a variety of configurations. USB 2.0 High Speed (480Mbits/second) and Full Speed (12Mbits/second) compatible. Dual Multi-Protocol Synchronous Serial Engine (MPSSE) to simplify synchronous serial protocol (USB to JTAG, I2C, SPI or bit-bang) design. Dual independent UART or FIFO ports configurable using MPSSEs. RS232/RS422/RS485 UART Transfer Data Rate up to 12Mbaud. (RS232 Data Rate limited by external level shifter). USB to parallel FIFO transfer data rate up to 10Mbyte/sec. Single channel synchronous FIFO mode for transfers up to 40 Mbytes/sec. MCU host bus emulation mode configuration option. Fast Opto-Isolated serial interface option. Option for transmit and receive LED drive signals on each channel. Enhanced bit-bang Mode interface option with RD# and WR# strobes. 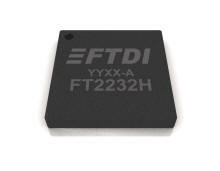 FT245B-style FIFO interface option with bidirectional data bus and simple 4 wire handshake interface. Highly integrated design includes +1.8V LDO regulator for VCORE, integrated POR function and on chip clock multiplier PLL (12MHz – 480MHz). Asynchronous serial UART interface option with full hardware handshaking and modem interface signals. UART Interface supports 7/8 bit data, 1/2 stop bits, and Odd/Even/Mark/Space/No Parity. Auto-transmit enable control for RS485 serial applications using TXDEN pin. Operational configuration mode and USB Description strings configurable in external EEPROM over the USB interface. Configurable I/O drive strength (4,8,12 or 16mA) and slew rate. USB Bulk data transfer mode (512 byte packets in Hi-Speed mode). +1.8V (chip core) and +3.3V I/O interfacing (+5V Tolerant). Extended -40°C to 85°C industrial operating temperature range. Compact 64-LD Lead Free LQFP/LQFN package and 56-LD VQFN packages. +3.3V single supply operating voltage range. Single chip USB to dual channel UART (RS232, RS422 or RS485). Single chip USB to dual channel FIFO. Single chip USB to dual channel JTAG. Single chip USB to dual channel SPI. Single chip USB to dual channel I2C. Single chip USB to dual channel Bit-Bang. Single chip USB to dual combination of any of above interfaces. Single chip USB to Fast Serial Optic Interface. Single chip USB to CPU target interface (as memory), double and independent. Single chip USB to Host Bus Emulation (as CPU).